In case your OS default language is not a Far East or other Unicode language, you might experience some troubles with providing support for these languages under Delphi or C++Builder. TsiLang handles Unicode languages pretty well, but you will need to do the following in order to properly display and edit such languages. Ensure that your OS is able to type the required languages, for example using Notepad application. 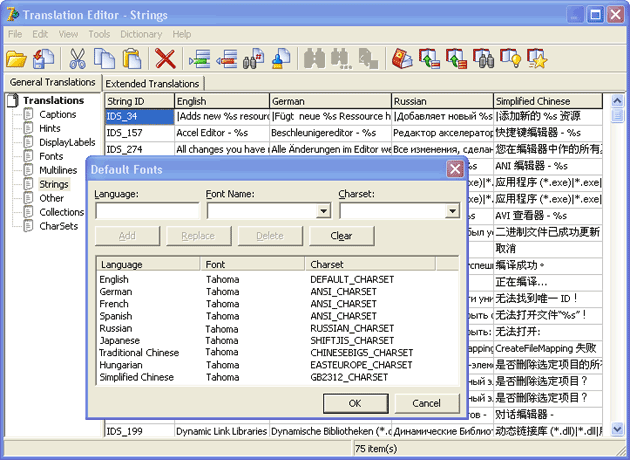 Open the TsiLang Translation Editor (double-click on TsiLang). Switch to the Charsets in the Tree and set the appropriate charset for the Unicode language. After this you will be able to type and see the required language under the Translation Editor. Information below is related to non-Unicode versions of IDE, like Delphi|C++Builder 2007 or earlier! To use Unicode VCL controls instead of standard controls. The Unicode controls like TNT Controls or LMD ElPack are also supported by TsiLang. To replace the standard VCL controls that are just wrappers for Windows controls like TButton, TCheckbox and others with the controls that take into account the Font and Charset settings whilst draw themselves. For example, TButton can be replaced with TBitBtn. Also you may need to add owner-draw functionality to the controls that can't be replaced, for example TComboBox. In that case you will need to draw each item manually in OnDrawItem event, and draw the text using the Font and Charsets settings. The case #3 is the most complex case. The most easy cases are #2 or #1. You can download this article in PDF format here: adding_support_for_far_east_or_other_unicode_languages.pdf.